An example for GNOME theming? 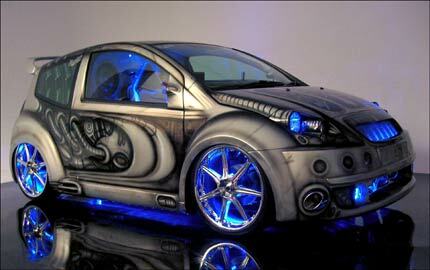 Seems Citroën agrees with me that Giger style theming is a necesity. I put up two versions of the crazy frog image for download here one 1280×1024 for desktop background use. And a bigger 640×480 version of the one I posted in my previous blog. This logo made by me could have won the GNOME 2.12 splash screen contest, at least it got the full endorsement of Luis. Unfortunatly due to a technical glitch another image will end up in the actual release, due to some silly rule about actually winning the contest. I announced today that Luca Barbato would take over as project lead in charge of sherpherding the Theora and Vorbis RTP specifications to completion. Due to various reasons this work got stalled, but hopefully with fresh blood at the helm we can move things to conclusion. A lot of people are expression interest in ‘Ogg’ RTP and it would be nice to have something ready for them to start implementing and adding to their programs. With Thomas and Wim having worked much lately on RTP streaming support in GStreamer and Flumotion it would also be nice to be able to have it ready so we could start implementing support for it in the GPL version of Flumotion. librsvg 2.11.0. It will probably be our last libart only release as most work goes towards CVS head where the Cairo support is added. Seems quite a few people agreed with my previous blog about eyecandy. Been thinking about how we could proceed with the issue. One thing which could be interesting to do was to host a call on for instance art.gnome.org where we ask artists to come up with mockups for what kind of themes or effects they would like to have available. Then we review those mockups and proposals and try to come up with a todo list for the various projects like GTK+, gnome-panel and Metacity for what they need to add in order to enable such things. Like if we want animated or shaped borders in metacity what would need to happen and how should it happen. If we want to have the gnome-panel look like a Giger like cloud of swarming larvas to go with our Giger inspired desktop, what would need to happen. The goal would be that GNOME continues to look like today out of the box, but people can grab themes and extension packs that can give them very dazzling looks to the desktop. Seems copyright infringement lawsuits are popping up like mushrooms these days. A couple of weeks ago I saw the movie the Island getting sued for beeing similar to an old movie called the Clonus Horrors. This week its the makers of the television series Lost who gets sued by a writer called Anthony Spinner who says he wrote something similar back in the 70’ties. And I have earlier blogged about the lawsuit against The DaVinci code book by Dan Brown. I have for a while held the belief that copyright was a good IP tool as it was weak enough to allow co-existence of a lot of similar works, which I think would be essential to avoid litigation hell in a world where huge amounts of books, songs and movies are made every year. Well hopefully the courts will prove me right and these lawsuits will fail, but if they don’t then I guess my beliefs about copyright are wrong. So I discovered the internet craze that is Pure Pwnage. Especially episode two is simply hillarious. I can even relate to Jeremy in the clips as I do tend to 0wn at Quake3 here at the office, of course it isn’t hard as everyone else here is a n00b. They also have a good Wikipedia entry. Cleaned up my SVG test page yesterday. It now have four different versions and both rendering backend of librsvg on display. Rock on me! After SVG Open got a lot of attention I got motivated to do something with SVG this weekend. So I created a bunch of scripts to generate png files from various svg rendering systems and a webpage displaying these png files side by side. The results can be seen here on my SVG test page. As you can see librsvg is compares pretty well to the competition, although it seems our recent changes to add Cairo support have lead to quite a few regressions as librsvg was almost perfect earler for the non-text tests on that page. So am using Epiphany currently, the GNOME intergrated browser. So I decided to try drag&dropping an image from the browser into the Gimp. Well it works as Gimp accepts the drop, but it turns out that since the Gimp in their brilliance don’t use gnome-vfs they didn’t have anything able to retrieve the image..great… So I decided to try EOG and gThumb instead, well it turns out these use gnome-vfs, at least EOG does, but they don’t accept the drop…..AAARGH, sometimes I want to scream! Lots of cool stuff happening lately. 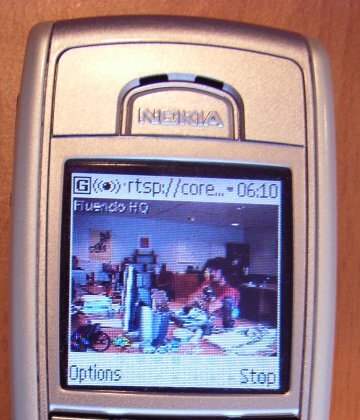 On Friday Wim and Thomas managed to get RTP/RTSP going with GStreamer and managed to put our office teststream onto a cell phone, I took some earlier pictures myself of a distortet testvideo signal, decided not to put them up as the office stream image looks much better. Jono Bacon put up a great article on Linux video handling, including a lot of talk about GStreamer and Pitivi. Make sure to read it!. GStreamer 0.9 is progressing fast, Wingo is porting over the soundcard mixer stuff currently which is one of the last remaining pieces for being able to port ‘GNOME’ over to 0.9/0.10. Plan on putting together a list today of plugins that needs porting in the hope of getting some community action going on it. I also went to the Barcelona FNAC store today to buy myself some comics as I figured it was the kind of easy reading that could get my going forward with my Spanish. They have a quite good selection of comics at the FNAC and I bought an Astrix album, 3 Thorgal albums and some belgian comics I hadn’t heard of before. Coming home I sat down to try to read the Astrix story first as I have it back in Norway in Norwegian. Got a bit disapointed at first that I wasn’t able to understand more of the dialogue as I felt I had started to get a semi-usable passive vocabulary from watching subtitled tv. Then after 4-5 pages I noticed the word ‘amb’ in a setence and my alarm bells started ringing. After some further investigation it turned out that album and all the albums I bought where in Catalan not in Castilliano(Spanish). Suxors. Guess I try to go trade them in on Monday again unless Wingo wants them for his Catalan learning. Anyway I got myself a big fat English/Spanish-Spanish/English dictionary also as my little pocket dictionary has its constraints. Been trying to use NetworkManager over the last year is it is theoreticaly a very nice solution. Unfortunatly it do have a lot of weird issues too. Today I filed this bug against it since it seems unable to let me get dns access to local machines. That combined with my older bug which I only see at home where it stops resolving random DNS entries. And there is of course the more cosmetic bug about how it should use the global keys before giving up connecting to a server. Hopefully with it being on the way into both Novell and Gentoo more eyeballs will help iron out the final issues. The Cairo backend for librsvg is quickly taking shape now that Dom, Caled and Carl and collaborating on it. Even though Cairo is quite unoptimized yet we are seeing some great effects compared to the libart backend. The gearflower.svg file for instance renders 6 times faster with librsvg-cairo than it does with librsvg-libart. As Cairo gets optimized the difference will increase even further. Good progress being made on all fronts with GStreamer 0.9 (maybe apart from making a new release from CVS :). With Ronald’s patch from bugzilla I was able to play Ogg, Avi and a Real file in Totem today. Only the Ogg near perfect, but still its nice to see things coming together. The new CVS Totem looks nice, great work from Bastien and Ronald.